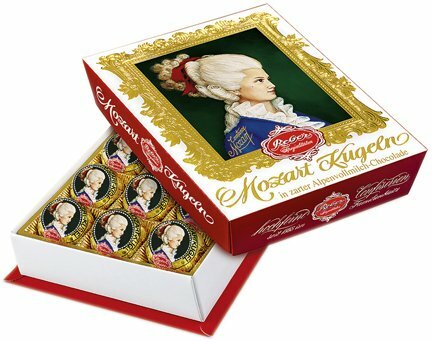 Presented in this beautiful 240g gift box, the Medium Portrait contains 12 individually wrapped Mozart Kugel. Made from only the highest quality, all natural ingredients, the 20g Mozart Kugel is composed of pistachio marzipan, with a hazelnut nougat center then doubled dipped in light then dark chocolate. Reber's Mozart Kugel one of the most popular gourmet chocolates in the world - a culinary homage to the great composer Wolfgang Amadeus Mozart. Mozart Kugel is composed of pistachio marzipan, with a hazelnut nougat center then doubled dipped in light then dark chocolate. The Reber Medium Portrait contains twelve individually wrapped Mozart Kugel. Reber since 1865 famous for the original Mozart Kugel, confiserie produced. Made with the finest ingredients, Mozart Kugel is all natural and Kosher. World-renowned for exquisite taste, Reber chocolates are shipped in attractive, award-winning, red and gold packaging. If you have any questions about this product by Reber Chocolate Specialties, contact us by completing and submitting the form below. If you are looking for a specif part number, please include it with your message.